Ciabatta bread and simple toppings, fresh from the local market, are all it takes to improvise a great fantasy appetiser. 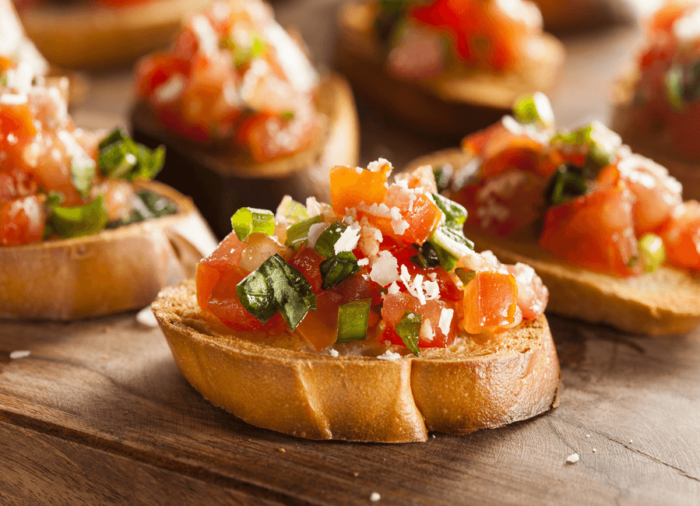 Roasted and flavoured with a drop of olive oil, salt and garlic, bruschetta is the Roman trademark starter. After all, you know, dynamite comes in small packages! Speaking of bread, Rome’s street delicacy is the pulled pork panini. Nice and smokey. Eat your fill! Any Italian will tell you that you just don’t serve pasta with meat. In fact, South African readers will be relieved to know that Romans take exception to this. They prepare the most succulent pasta and pancetta recipes! Spaghetti carbonara and amatriciana bucatini, loaded with pecorino cheese and black pepper, are surely the South Africans’ preferred gateway to Italian food. What’s more, the best restaurants in the city will send you into rapture with their more sophisticated version of carbonara – which they call Gricia – made with guanciale (cheek pork meat). We suggest Roscioli in Campo de’ Fiori, who are famous for great pasta dishes and a superb wine list. Rome’s wide range of culinary delights also features unique recipes and local ingredients, which you can only eat in Rome. Carciofi alla Giudia (akaRoman artichokes), cooked in oil, garlic, wine and herbs deliver a delicate, but layered flavour. You should also try Saltimbocca alla Romana, made of lightly cooked veal, prosciutto and sage. Abbacchio is a festive lamb stew, and some say the Carnevale season is not the same without it! Lastly, oven made Gnocchi alla Romana are semolina medallions which will melt your heart as they deliquesce in your mouth. Casa Prati on River Tevere offers a dynamic menu of local food cooked to perfection.